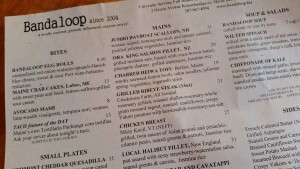 Bandaloop is my favorite restaurant in Kennebunkport. It’s not the ‘fanciest’ place in town, but you can’t beat the food here! In fact, we love it so much that we chose Bandaloop for our 22nd wedding anniversary dinner last night. 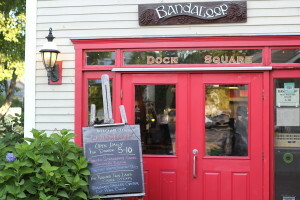 We first dined at Bandaloop in 2012 when we were just first time Maine tourists, before buying our Bed and Breakfast. We had stopped in at Northlight Gallery on Ocean Avenue to view the artwork, and were chatting with the owner and painter Harry Thompson. He was the one who recommended Bandaloop to us (thanks Harry!). I remember his words exactly; “Get the mussels and lots of bread to dip into the sauce”. I don’t eat mussels, thankfully Roger does, and I just dip the bread in that lovely garlicy sauce as Harry recommended. He was right – Delicious, and we were hooked. Tucked away on a quiet side street in Dock Square, the atmosphere is relaxed and casual with an eclectic feel. An added benefit is that they are only a 10 minute walk from the Inn. Bandaloop is owned by husband and wife team Scott and Bridget. There are two dining rooms. The main one, with the bar and the open kitchen, is great as you can watch Chef Scott and crew work miracles from a tiny space. We were sat in the main dining room on our first visit with George HW and Barbara Bush a couple of tables away. Like the rest of us locals, they like to dine here too! About the only thing you can’t get at Bandaloop is lobster. But hey, you can get that anywhere else in Kennebunkport so it’s not missed. They buy their ingredients from local and organic suppliers and all of Scott’s dishes have a full, fresh flavor. Their menu is fairly consistent from season to season with the staple dishes that they’ve become known for. The macaroni and cheese is a personal favorite of mine. Consider the half portion as Scott doesn’t scrimp on serving sizes! I order the Pomegranate Cosmopolitan to sip while I try to decide what to eat. Roger drinks either the Peak Organic or Allagash beers on tap, both local Maine brews. There will always be a soup of the evening which is often vegan and/or gluten free. Chilled Carolina Peach with Sugar Cured Jalapeno Bisque, Chilled Carrot Habanero, and Apple Roasted Poblano Coconut Milk Bisque have all featured this summer. His salads are a brilliant combination of flavors and fresh greens. We always start our dinner with an appetizer. Their new Quesadilla is my new favorite. Roger really likes the egg rolls and struggles to choose between those and the before mentioned mussels. Although the new Taco choices are making it even harder for him to decide. Big Eye Tuna Taco’s?! Enough said. If you are into fish and seafood, Bandaloop has you covered. They almost always have a fish special with choices like Ginger Grilled Swordfish and Pan Seared Halibut. Scallops are featured on the menu too. And if you prefer something not fishy, you can choose from pork chops, steak and chicken dishes as well. All of the entrées are served with a large helping of mixed vegetables and potatoes or rice and specialty sauces cooked up by Scott in that small kitchen. I really do have a hard time not ordering the macaroni and cheese when I eat here (yes, it’s that good). 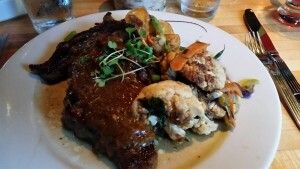 However, last night I went with a perfectly cooked Rib Eye steak in a light rosemary reduction served with Yukon Gold potato wedges and charred cauliflower. Roger ordered the Shrimp Tacos (no surprise). For his entree, he ordered the Lamb Steaks special. They were cooked in a cornmeal crust with garlic mashed potatoes and a load of mixed vegetables. We usually don’t make it to dessert, but since it was a special occasion, we shared the Mixed Chocolate platter. A delicious slice of chocolate torte with a chocolate nut bark and chocolate covered almonds dusted with cocoa powder. All of this with a raspberry coulis on the side. We were thankful for the walk home! Chef Scott is particularly good at catering to those with specific dietary requirements and he’s well known in Kennebunkport for his Vegan dishes (they even stock vegan wines). He is happy to consult with diners who have any specific dietary limitations so he can prepare something tailored to their requirements. Thank you to Scott and Bridget for a wonderful anniversary dinner and for 3+ years of great dining with you! See you again soon.